1. Eight hours before: Slice your kumquats horizontally and place in a dehydrator* for about 4-6 hours, until completely dry. 2. 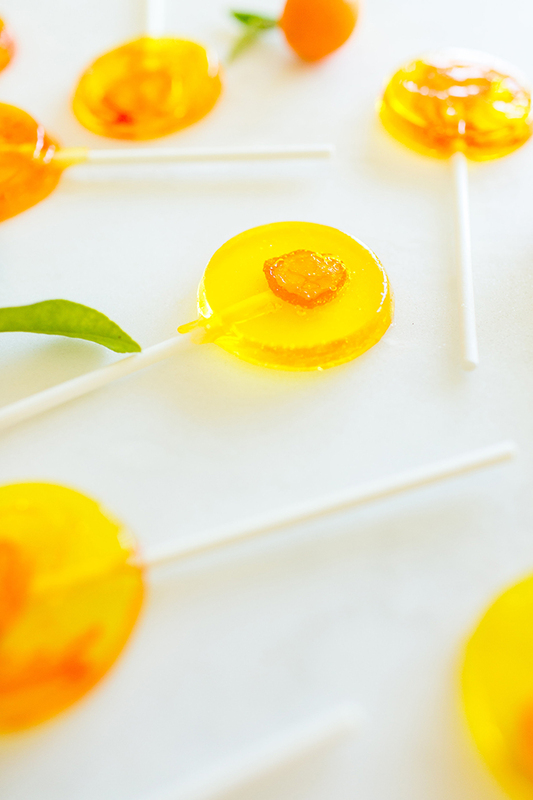 Once your kumquat slices are dry, it’s time to make your pops! Spray your lollipop molds with nonstick spray. 3. Place the water, sugar, and corn syrup in a small pot set over medium high heat. Whisk to combined and let the mixture come to a boil. Make sure not to whisk or stir the mixture again. Set your candy thermometer into the sugar mixture, and let boil until the temperature reaches 290 degrees. 4. Immediately take off the heat and add in your kumquat juice, vanilla extract, and yellow food coloring. 5. Working quickly, pour the sugar mixture into each mold and top each with a stick. Add a kumquat to the middle the mold and press down gently. Make sure to work fast (but safe!) so the sugar mixture does not harden on you. If it does harden, you can place it back on to a low heat until melted again. 6. 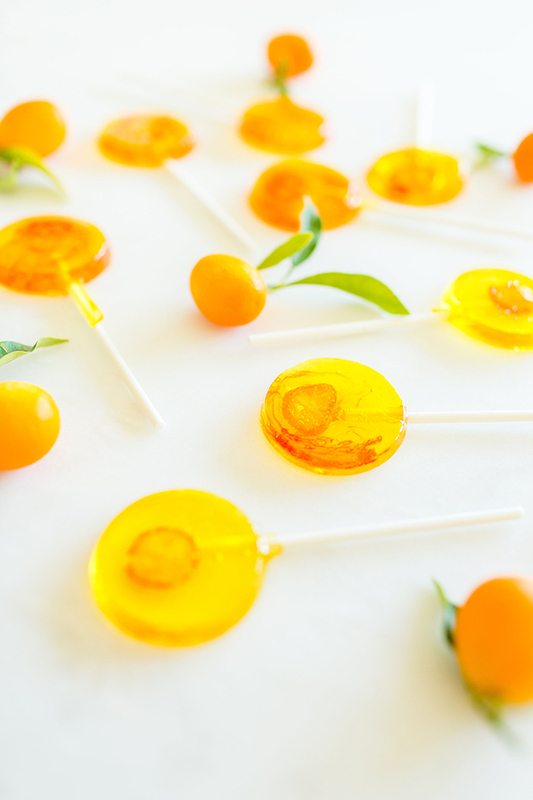 Optional: If you want to make an orange swirl in some of the lollipops, dip a toothpick in the orange food coloring and swirl the toothpick in a circular motion around the kumquat. 7. Let them cool and harden completely, about 20 minutes. *If you don’t have a dehydrator, don’t worry! You can use your oven. Instead, place the sliced kumquats onto a lined baking sheet, place into the oven (preheated to the lowest temperature), and bake for about 6 hours, or until kumquat slices look dried out. 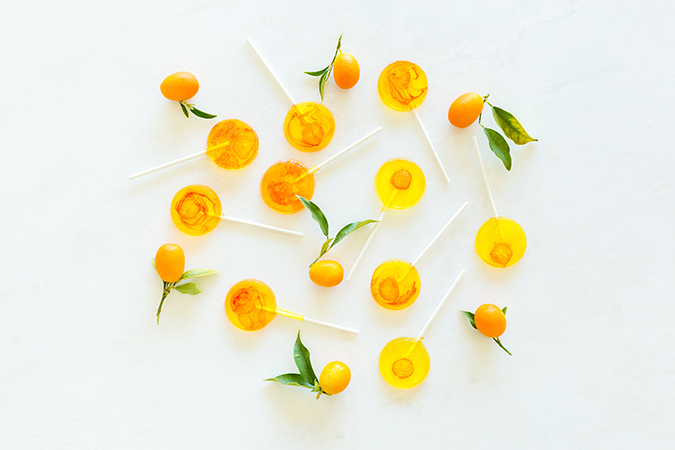 These kumquat lollipops are super unique treats to have on display at a party or even for a homemade gift for a friend who loves candy. Have you ever made homemade candy before? 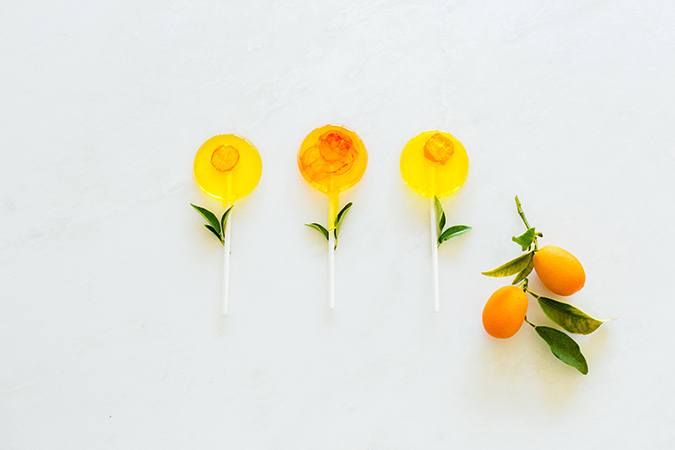 What flavors would you put into your lollipops? Let me know how yours turn out in the comments below! And thanks again to Lauren Lowstan for making these beautiful treats.